The past years, it seems that “eco-friendly” products are all the rage. But, that’s because it is not about a trend—it is about your health. With growing concerns about the safety of the world and environment, it is a critical time to rethink the way we live life by picking and choosing better products for our day-to-day activities. This especially includes the products we clean with. Studies continue to reveal just how harmful traditional cleaning products are; now, what do you and your family do about cleaning your home? 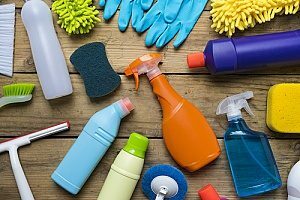 It may surprise you to know that there are many eco friendly cleaning products brands out there that are great for the environment and they are great for your home, too! Here is our list of the top 6 eco friendly cleaning products and brands. Using eco friendly cleaning products in your kitchen is essential for a safe and clean environment to eat and prepare your food. Eco friendly surface cleaners are especially important for ensuring that your tables, kitchen countertops and cabinets are clean and leave no toxic residue. A highly accomplished company in the eco friendly field, Seventh Generation provided the home cleaner market with the first disinfectant with all-natural ingredients to receive approval from the Environmental Protection Agency. With such a large accomplishment on their hands and with the environment counting on the best in safe products, Seventh Generation has continued to bring some of the best in eco friendly cleaning and their multi-surface cleaner is a great solution for your kitchen’s cleaning needs. With soothing smells like thyme and lemongrass, we highly recommend this product for use for your countertops and kitchen surfaces. Want your kitchen cleaned without all the heavy, harsh smells? Force of Nature offers many eco friendly cleaning products, including their multi-surface cleaner. Don’t allow the lack of smell to fool you into believing it isn’t effective—this product has a deodorizer and disinfectant all wrapped up into one. No more need for products filled with bleach, ammonia, and other questionable chemicals. We’re certain you can find what you need in a home cleaner with this amazing, natural product. 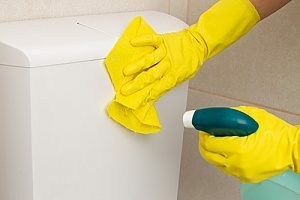 Having eco friendly cleaners in your bathroom is also very important. When cleaning your shower, toilet, or sink countertops, you want to ensure that you have the cleanest environment without worrying about toxic chemicals ruining your bathroom. The Honest Company, founded by famed actress Jessica Alba, began with baby products that promoted transparency in ingredients. Since then, The Honest Company has expanded tremendously, offering a range of products used in the home, including home cleaning items. We recommend The Honest Company bathroom cleaner because of the affordable price and the use of safe ingredients. This product is free of ammonia, bleach, and other chemicals that may cause worry for families that are environmentally cautious. Offering a range of household cleaning products, Mrs. Meyer’s prides itself on providing eco friendly cleaning products that give your house a fresh, natural smell using natural ingredients. 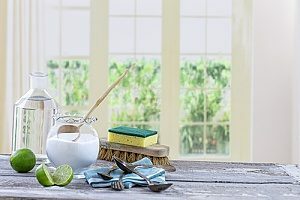 Mrs. Meyer’s offers multi-surface bathroom cleaners, just like your popular brand, but with scents like lavender, mint, basil, rosemary, geranium, and lemon verbena (all naturally-scented, by the way), you’re sure to delight in these products more than harsh products that only leave a bleach smell behind. With budget-friendly prices starting at $3.99, Mrs. Meyer’s is a product we can back proudly. Your living room is another area of your home that is no exception to benefiting from eco friendly cleaning products. Products like an eco friendly baking soda can make all the difference of protecting your home from harmful chemical cleaners. You may be surprised to see this on the list, as Arm & Hammer is a well-known U.S. cleaning brand. Don’t assume that all traditional brands should be tossed out; Arm & Hammer carries products that do no harm to the environment or your home. Arm & Hammer’s famous baking soda is an excellent eco friendly deodorizer for your carpet. Shake some of the product on to your living room carpet, let it sit for about 30 minutes, then vacuum it up. This all-natural product natural removes foul-smelling odors and keeps your wooly floor smelling fresh. For eco friendly cleaning, we simply must recommend this all-American favorite. When you do your weekly laundry you want your clothes to come out of the washer and dryer clean and fresh. You’ll love knowing that a laundry detergent will protect your clothes in an eco friendly way. A new company in the home scene is True Products. ing natural-based products. True was established in 2012 and specializes in many household cleaning products. Their most popular product is the True Detergent. True’s laundry detergent is concentrated 4 times to limit the amount of soap needed for loads of laundry. This also cuts down on plastic used to hold the detergent, too. Designed with family safety in mind, True’s detergent ingredients are all-natural and safe for sensitive skin. Additionally, True Detergent is Halal-certified and is void of animal fats that are often hidden in many well-known household products. For all the reasons mentioned, we highly recommend True Products. For the family that’s cautious about what goes in and out of the home, it’s refreshing to know that many companies are making great strides in keeping homes clean, as well as keeping the environment intact. By choosing to purchase the products listed, instead of choosing traditional products with toxic chemicals, you’re helping to do your part in the fight for a better, ecologically-safe world. Continue to do right by the environment by doing your own research on other ways to maintain ecological sustainability. If you’re interested in other eco friendly cleaning products in your dining, check out our selection of dishware products. Kangovou offers the best in BPA-free lunchboxes, utensils, dishware, and more.